Home » Sleeps5 Blog » Sleeps5–It’s Black History Month, let’s Celebrate! February is Black History Month, also known as African-American History Month, in the USA and the teacher in me just can’t help herself. 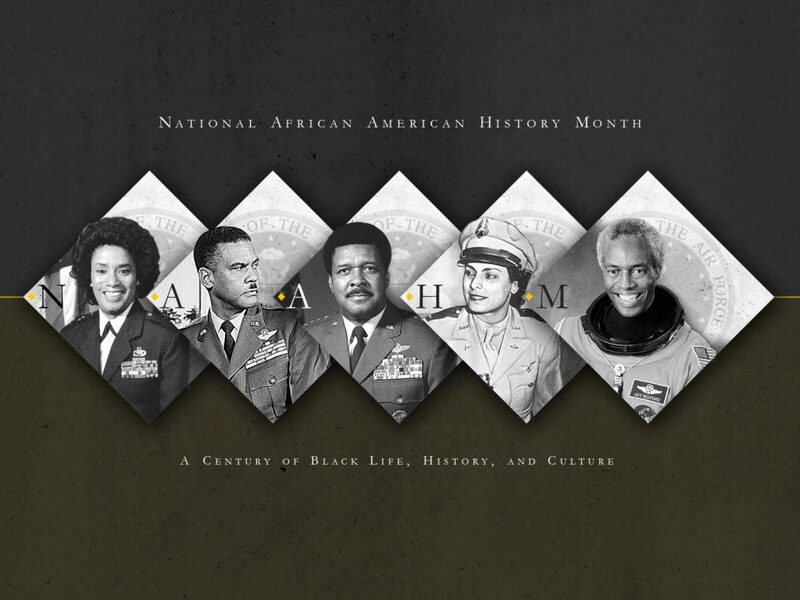 Readers will find below a collection of sites that represent the accomplishments, contributions and stories of African-Americans in the United States. And for further information, I have included some links to various prominent historical figures and museums. They could be good travel destinations to celebrate Black History Month. Africans first were brought to the New World around the 1500s with the arrival of the Spanish and an enslaved work force from West Africa. Many years later, on August 20, 1619, Africans arrived in Jamestown, Virginia as forced labor for a nascent colony. Since that time, the people of this land have struggled to fulfill the dream of equality and freedom for all, while maintaining unity among disparate people of conflicting heritages. Photo above from U.S. Air Force graphic by Brandon Deloach. 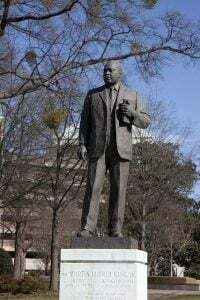 Statue of Dr. Martin Luther King, Jr., in the Kelly Ingram Park, Birmingham, Alabama. Ebenezer Baptist Church – This church is important because of its connection to Martin Luther King. He was co-pastor from 1960 until his death in 1968 along with other connections. Atlanta University Center Historic District – This center represents the significance and importance of the traditionally black colleges located in this area. Freedom Rides Museum – This museum explains the story behind the Freedom Riders who used non-violent protest to oppose segregation of the bus system in the South. African Meeting House: Frederick Douglass, the famous abolitionist, spoke at the African Meeting House. In 1832, an anti-slavery foundation was established here as well. W.E.B. Du Bois Homesite (Great Barrington, Mass) – This is the boyhood home of the founder of the NAACP, also, a writer, educator, human rights activist, Haravard Ph D., intellectual . . . accomplishments are numerous to list. Check this guy out! Monticello – Monticello is the home of Thomas Jefferson: a slave owner and founding father. It is also the home of his slaves who worked on this property including his children by an enslaved woman, Sally Hemings. Docents at Monticello provide visitors with lengthy descriptions of the living and working realities of its enslaved workforce. DuSable Museum of African History – This museum was founded by Dr. Margaret Taylor-Burroughs and her husband Charles to conserve African American art, history and culture. Ida B. Wells-Marnett House – (not open to the public) Ida B. wells was an educator, journalist, anti-lynching advocate, promoter women’s suffrage including that of black women among many other things. She was awesome, check her out!! National Underground Railroad Freedom Center – This museum spans the struggle for freedom from the time of the Underground Railroad (safe houses leading enslaved blacks from slave states of the south to free states of the north) to the contemporary era. Charles H. Wright Museum of African American History – This museum has many revolving exhibits covering the history of African Americans. It has repeatedly received a TripAdvisor Certificate of Excellence award. International Civil Rights Center – The International Civil Rights Center houses the original Woolworth lunch counter where young men staged a non-violent sit-in challenging segregation in restaurants. Hampton University National Landmark “Little Scotland” – This is a National Historic Landmark where southern slaves fled to the Union during the Civil War. Daisy Bates House (not open to the public) – Mrs. Bates provided safe haven and mentoring to the Little Rock Nine, who ultimately desegregated Little Rock Central High School. National Rights Museum – This museum is located across the street from the Lorraine Hotel which is the site of Martin Luther King Jr.s assassination in 1968. Langston Hughes House – Langston Hughes is most famous for his poetry, writing, social activism and as a leader in the Harlem Renaissance. African Burial Ground – The African Burial Ground is located in Lower Manhattan. It is the site of an archaeological discovery made in 1991 where the remains of 400 Africans were found. The burial site dates from the late 1600s to the late 1700s. Apollo Theater – The Apollo is a historic music theater that promoted black performing artists. It is an important cultural touchstone having far reaching impact onto pop culture today. Malcom X Birth Site – Birth site of prominent civil rights activist. Mother Bethel AME – This is the oldest continuously owned church by African Americans (Richard Allen Museum). American Civil War Museum and Canal Walk – This is one of our family’s favorites. It offers perspectives about the Civil War from Union sympathizers, Confederate sympathizers and African-Americans. The Canal Walk provides a history of Richmond including the experiences of its enslaved people. Monument to Arthur Ashe – Arthur Ashe broke barriers in the professional tennis community. He won three Grand Slam titles. Monument Bill “Bojangles” Robinson – Mr. Bojangles was a famous tap dancer who was appreciated by wide audience. Jimi Hendrix Statue – The statue is located in the Capitol Hill neighborhood on Broadway. Tuskagee Institute National Historic Site – Tuskagee University started as a school for “colored” teachers. Its principal was the famous educator, Booker T. Washington. It is also renowned for its flight school that resulted in the Tuskagee Airmen who fought in WWII. Mary McLeod Bethune House – This is the home of Mary Mcleod Bethune known for her civil rights activism on behalf of black women. The child of former slaves, she received a formal education and went on to open a school that later became a college. She was appointed by Franklin Roosevelt to oversee or represent part of the New Deal implementation. As long as this list is, it is but a snippet of what is available to families interested in American History highlighting the art, culture, accomplishments, contributions, struggles and heritage of African Americans. 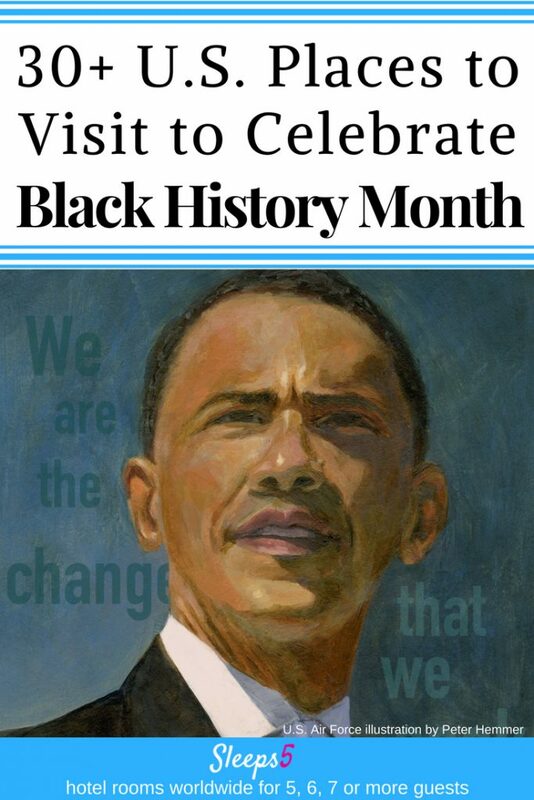 Please feel free to add on your favorite links and stories and destinations or ways of celebrating Black History Month.